I have always found Black-billed Magpies (Pica Hudsonia) fascinating due to their flashy appearance, although they are not everyone’s favorite bird since they can be noisy. As you in see in this photo, they are quite beautiful in the light, with their black and white feathers with shades of fluorescence. This one was with several others who had found some roadkill, and they were flying back and forth every time a car came by. 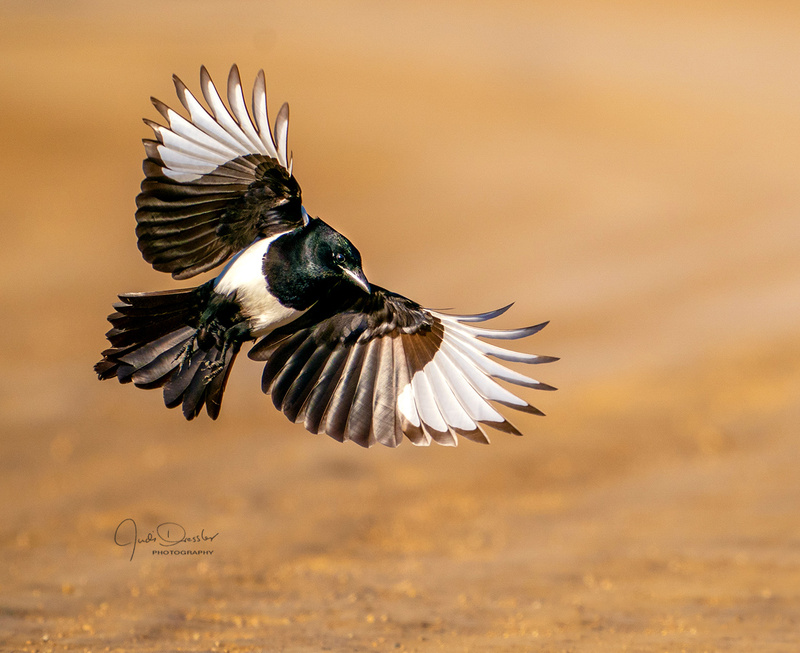 In an earlier era, farmers and ranchers tried to exterminate Black-billed Magpies because they were considered detrimental to game-bird populations and domestic stock, but to no avail. They are common today in open country and even in towns in the American west. Though they like open areas, these birds, who are in the crow family, stay close to cover for protection from raptors. Often their nesting territories will follow stream courses. Magpies don’t avoid human development, often spending time near barnyards, feedlots, and grain elevators, where they have access to food. Black-billed Magpies are intelligent birds in the Corvid (Corvidae) family, and are related to jays, crows, and ravens.